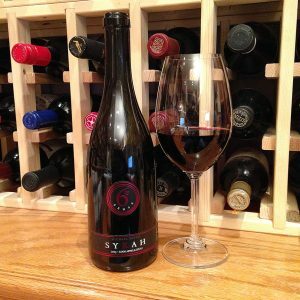 Ink-dark color; melange of dark fruit, vanilla, mint hint, bacon on robust nose; ripe blackberry, boysenberry, raspberry, chocolate, plum, pepper, spice, oak on generous palate—if you want a dark fruit flavor, you probably can find it somewhere in this dense, big wine. Adequate tannin, nice acidity (3.48) balance the dark fruit jam. “Michael” and “David” are brothers Michael and David Phillips whose family has farmed fruits and vegetables in the Lodi region since the 1850s and cultivated wine grapes for almost 100 years. 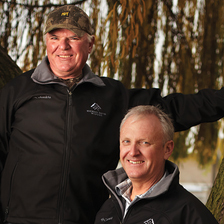 Michael and David are the fifth generation of grape-growers; the sixth generation recently joined the family business, with Kevin Phillips and Melissa Phillips Stroud part of the team. Family focus: quality wines with unique and eye catching labels.